All localization project statistics are useful. It is good to know what is the project like and what has been done so far. Reports help for example in resource allocation, project management and budgeting. There are four types of statistics and reports that are especially important for every localization and translation project. Let’s go through them one by one. Project Statistics show the current project status. Every project manager should care how the project is progressing. And every translator should be interested in knowing how much there still is left to translate. The number of words, segments and characters are an essential part of project statistics related to the source file. In addition, the project statistics usually have information about the translated material as well: the number of translated and untranslated words, and the current status of the project progress. These are the basic information all projects should have. Statistics Report is a more detailed report showing the statistics of the project status. As compared to the project statistics (i.e. the project’s current status info), the statistics report usually contains more detailed information related to the project’s current status and translation history. A detailed report like the statistics report is most useful for organizing and managing purposes. With the statistic report the project manager is able to see how many words have been translated automatically (with the help of either MT or TM), which automatic translation have been rejected, how many words have been changed, what kind of changes have been made, and so on. Project Validation Report is extremely important in every software localization project. Usually project validation report offers information on how the translation fits into the technology. When localizing software or applications it is crucial that the translation meets the technical requirements and limitations. For example, if there are an extra or a missing space the translated application may not work correctly. A common project validation report includes statistics how many validations failed per each project target or validation rule. 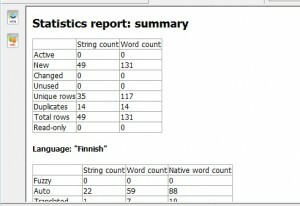 Translation Validation Report includes information about how well the material matches with the translation memory. A translation memory is a file that contains validated translations. It is used commonly in large or repeated types of translation projects to ease and expedite the translation work and to increase the translation consistency. The translation validation report indicates how the existing translation memory fits into the current project. This information is useful to both project management and translators because it helps to estimate the required work load. Multilizer Localization Tools provide clear statistics and reports to all localization projects. You can concentrate on optimizing your project and making the best out of your resources. Learn more.